Preheat the oven to 300 F. Line a large baking sheet with parchment paper. Put the whole almonds and flaxseeds in a blender and blend on high until a flour-like consistency. Put in a large bowl; add oats and all other dry ingredients. Mix well. In a small bowl, whisk together the maple syrup, honey and oil until well combined. Wash your hands. Add the wet ingredients to the dry, using your hands to mix in well. As you work with your hands, meditate on the natural goodness of the whole grains and nuts you are lovingly preparing for your family. Marvel at the combination of complex carbs, protein, and omega-3's this treat will provide your children. Luxuriate in the money and packaging you are saving by making this yourself. :) This is the most important step. Because we're going granola, baby. 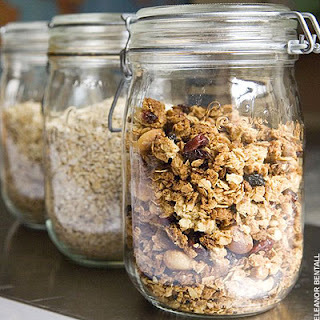 Spread the granola evenly onto the prepared sheets and bake for 45-55 minutes, removing the pans from the oven half-way through, flipping granola gently with a metal spatula, and rotating the pans to ensure even baking (move the one on the top rack to the bottom, the bottom to the middle, the middle to the top). Remove the pan from the oven when the granola is golden brown (but not burned!) and dry. Eat some. Eat a little more. What's left over, store in an airtight container for up to 2 weeks.